I hear about people who install Sonos speakers and pipe music all over the house and they seem to love it. I find that fascinating because it would annoy the heck out of me if someone else in my home decided what music I was going to be subjected to (and any music at all). It would have to be a highly-regulated, multi-vote system for me to even agree to this as an option. Except at Christmas. We decided to have an open house this past weekend to celebrate the completion of our five months of misery remodeling most of our house. Normally we would put Steve’s favorite five CDs into our 1993 Sony CD player and cycle those songs over and over again. The audio would come out of the large speakers he got around the time we got married, 35 years ago. We have a HomePod which gets very little exercise, so I thought it would be more fun to use that. We even have a family plan for Apple Music, so we could expand our horizons beyond those five CDs. The HomePod lives on top of the refrigerator in the kitchen, so I unplugged it from there and put it in the living room on top of the vinyl record player. I tell you, it’s like a way back machine in our living room! I asked HomePod to play Christmas music and it sounded great. But only in the living room. I wanted a way to extend this music throughout the house. I suggested to Steve that this was a good excuse to buy another HomePod. He didn’t think that was the wisest use of our money since the original HomePod doesn’t get much exercise as it is. I remember hearing all kinds of excitement when AirPlay 2 came out. AirPlay is the technology that lets you throw audio from your iOS or Mac to HomePod or to Apple TV. The advancement that came with AirPlay 2 was that you could throw the audio to multiple Apple devices at the same time, with no noticeable lag between them. Of course, our house is riddled with Apple TVs, so I decided to see if I could make AirPlay 2 work for me. The good news is that while our audio in the living room is from our childhood, the speakers hooked up to many of our TVs are quite modern and sound great. I already had an Apple TV 4K in the family room where our best audio lives and Steve has an Apple TV 4 in his den hooked up to a TV with a nice soundbar and a subwoofer. In the Music app, I started up the Christmas playlist. 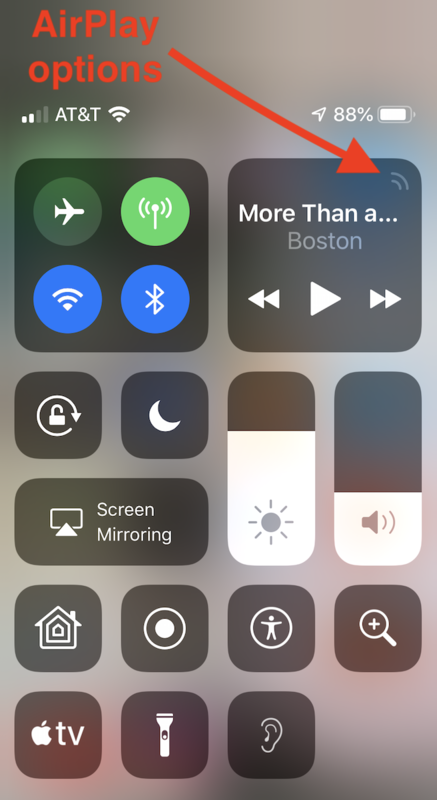 In Control Center, you can then see the audio that’s playing and there are two little tiny arcs in the upper right corner of the audio icon. If you tap on that icon in the corner, it brings up AirPlay to the audio you have playing. Below the audio controls, you’ll see your iOS device followed by the other audio devices to which you can AirPlay. 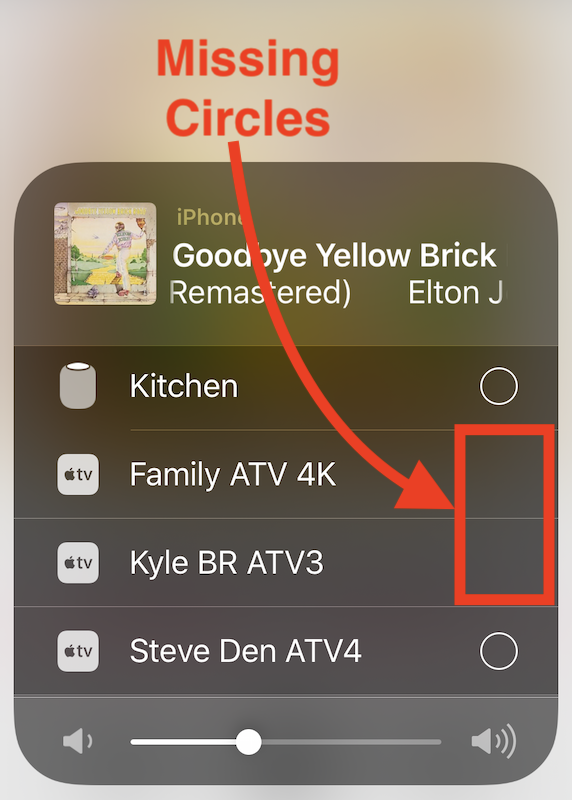 If you have newer Apple TVs (generation 4 and 4K) and HomePods, you’ll see them listed with circles to the right of each one. This circle means you can add them simultaneously. If you see a device listed but no circle, like Apple TV generation 3, that means it doesn’t support AirPlay 2 and so you can only play to it and nothing else at the same time. 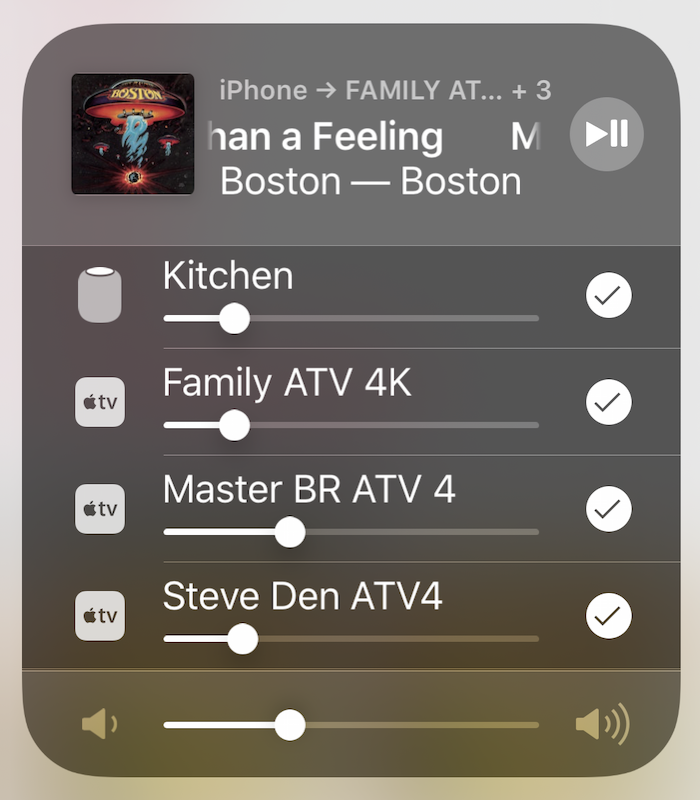 I tapped all of the AirPlay 2 capable devices and audio immediately came out of … only some of them. Everything is fiddly, right? The weird thing about this setup is that the TVs have to be on for AirPlay to be able to play. This is true even on setups like our family room where we have an audio/video receiver that sends the audio directly from the Apple TV to the speakers. In some cases, tapping the Apple TV in question turned on the TV automatically, but in our kitchen with a really cheap Vizio hooked up to the JBL speaker, I had to turn it on manually. I also had to flip some of them on and off a few times in the AirPlay screen to get them to play nice but eventually, they all joined the party. One thing I found interesting is that I could control this hive mind of audio without using my phone. I hollered out “hey S-lady!” and suggested she skip to the next song or play something completely different. HomePod took over and obeyed my commands. That got me to thinking, who was really controlling things. Was my phone even necessary any more? I decided to do an experiment. I fired up my phone, pushed the audio to one of the Apple TVs and then put my phone in airplane mode and the music continued to play on the Apple TV. Then I turned off the iPhone, and yet the music still played on the Apple TV. So that was interesting. Then I tried connecting to two Apple TVs at the same time and putting my phone in airplane mode after they started playing. Again both Apple TVs continued to play the music. I turned my phone off … and both Apple TVs stopped playing the music instantly. Hmmm. After restarting my phone tried to repeat the experiment, but that time all of the Apple TVs in the house and the HomePod were pretending to be old devices and would only play one at a time. I quit Music, went in and out of wireless settings, changed networks, and then only some of my AirPlay 2-capable devices indicated they could play simultaneously with that little circle! Fiddled some more, and then they all got their little circles. But none of them would actually connect. Around this time I got bored and gave up on the experiments. I think once you get your Apple TVs and/or HomePods playing your audio, you can stop using your phone to control them but I can’t be sure as my testing was inconclusive. What I can say conclusively is that you don’t have to go buy a bunch of Sonos speakers to play audio around your house. You only need a pile of Apple TV 4s or higher and/or a HomePod or two. It was lovely to have holiday music making our entire house more festive during our party. I can also conclusively say that everything is fiddly.